The financial services industry is evolving, and the importance of proper compliance has never been greater. At USA Financial, we're committed to doing things the right way, and we understand the importance of compliance. However, being compliant doesn't have to mean you can't have effective marketing. Our philosophy is simple — if the compliance department and the marketing department can simply communicate and work together, we can better serve our advisors and provide them with an effective solution to their marketing needs while still being compliant. We're fortunate enough to have assembled a team of attorneys in house that work closely (and meet frequently) with the marketing and new business department so that we have a thorough understanding of what one another are doing and trying to accomplish. We strive to make it easy for advisors to communicate with the compliance department so they know we are working towards the same end goal... increasing business opportunities while remaining in compliance. We've specifically built our marketing and compliance tools to better serve the advisor and create the ultimate experience for our affiliated advisors. Perhaps the greatest advantage to affiliating with USA Financial is the Plug-N-Run marketing tools made available to advisors. While these tools have been proven to be the most successful and comprehensive set of marketing tools made available to independent advisors, what is the most remarkable is the embedded compliance review of these tools. The vast majority of the Plug-N-Run marketing tools have been reviewed by FINRA, so advisors can be confident in the knowledge that they have been seen by the very regulatory body that oversees their activities. It can be argued that the two most important elements to an advisors long-term success in the financial services profession are marketing and compliance. Unfortunately, most organizations will turn a blind eye towards one of them. Most broker/dealers are equipped to handle the compliance functions for their reps, but lack the ability, desire, and willingness to proactively build (and test) marketing programs for their advisors. On the other hand, there are dozens of marketing organizations who will introduce a marketing program to their advisor, but it's never been seen by anybody in the compliance world (regulators included). This lack of interest (or ability) to provide compliant marketing materials to advisors leaves the financial professional extremely vulnerable to regulatory actions, fines, or discipline. 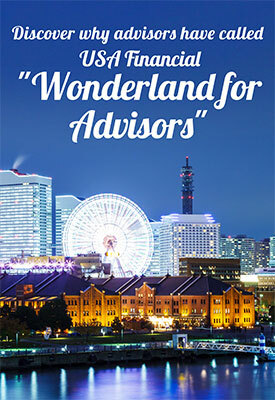 Our unique structure is what has led many advisors to nickname us "Wonderland for Advisors," as they are able to effortlessly plug in to proven marketing systems that have already been compliance reviewed. USA Financial Securities provides AdTrax, a streamlined compliance software package to its affiliated representatives. AdTrax provides an on-line submission, tracking, and approval process of advertising materials. AdTrax also archives reps' approvals for future use and has a "sharing" mechanism for reps to share their approved advertising and marketing material with other reps should they choose to participate. This easy-to-use submission process is accessed through your secure login, located within the USA Financial Dashboard section of the Financial HQ Technology Suite. How quickly are items reviewed? 69% of advertisements are reviewed/responded to within 24 hours of submission. 85% of advertisements are reviewed/responded to within 48 hours of submission. 98% of all advertisements are reviewed/responded to within one week of submission. This includes powerpoint presentations, articles, social networking, blogs, and other marketing materials. If you're going to be in the securities or investment advisory business, you know you have compliance and continuing education requirements. USA Financial is committed to providing this to you in a fashion that will result in the least amount of business interruption. USA Financial Securities provides RegEd for compliance and continuing education support.RegEd provides our reps on-line compliance meetings to meet regulatory requirements and keep pace with industry trends, while eliminating the costs and lost time of traveling to a traditional compliance meeting. RedEd provides our reps firm element continuing education programs to meet additional industry requirements and to be knowledgeable with industry's rules and regulations, again without the costs and need of travel. FINRA regulations require us to track and retain the e-mail correspondence of our affiliated advisors. USA Financial Securities provides AdvisorMail to provide regulatory email tracking and retention. AdvisorMail helps to reduce the time reps and their staff would normally spend manually submitting copies of all email correspondence, email marketing & email advertising. USA Financial Securities has a proprietary on-line system for affiliated advisors to utilize to maintain all the necessary industry reporting logs and blotters. This system is a great support tool in the event of a regulatory audit, as well as on-going business operations, as our back-office support team can help you readily access any necessary reports, logs or blotters and conduct specific product type or client searches on your behalf. TradeSphere allows reps to maintain personal investment accounts held outside of USA Financial Securities’ clearing firm relationship with Pershing, should you so choose. Our team reviews all transactions the day they are received, and communicates with you along the way so you are able to track the current status of every case submitted with relative ease through the USA Financial HQ Dashboard.